Join us on March 19th for our launch party at Right Proper Brewing Company! Bring your friends and mingle with other supporters of conservation and development work in Madagascar while enjoying live music and $1 off in-house beers. All guests get one free raffle ticket, and we have a ton of great prizes (buy more tickets to up your chances!). 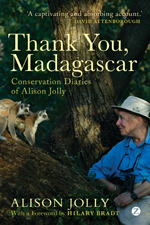 It’s free to attend, and you’ll get to meet a ton people doing work with lemurs and Madagascar. We want to see all of you there! » See the Facebook invite and RSVP! Take the green or yellow line to the Shaw metro stop and take the Howard University exit. 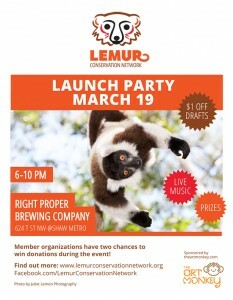 Right Proper is lemur-izing one of their signature beers for the night with a special lemur name! We’ll have the book for sale from 6 to 8 pm. Get to the party by 7 pm for a chance to win a free copy! The Art Monkey will be donating $5 for every social media mention of the Lemur Conservation Network during the event (up to $500), so be sure to brag all night! We’ve chosen our Winning Member Organizations for the party! 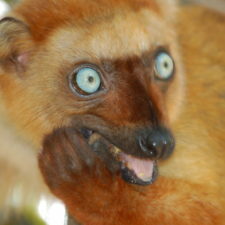 We didn’t want to choose favorites (all of our organizations do amazing and inspiring work to protect lemurs! ), so we drew two members out of a bin to select the organizations that will receive donations during the launch party. Sadabe will receive the donations from guests during the party, and will benefit from the raffle! Congratulations, Sadabe! 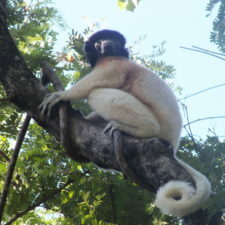 Conservation Fusion will win the #ilovelemurs donation from our website partner The Art Monkey. Congratulations, Conservation Fusion! We encourage our members to send a representative to the event, so you can share your story with guests. You are welcome to bring materials to share on our information table. If you or a representative of your organization plan to attend, be sure to let us know! 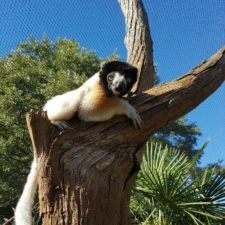 The Art Monkey will be donating $5 for every social media mention of the Lemur Conservation Network at the event (up to $500) to Conservation Fusion, who does inspiring conservation education work in Madagascar. So, keep your phones handy, and brag all night to your friends on Facebook and Twitter that you’re at the hottest conservation event of the year! 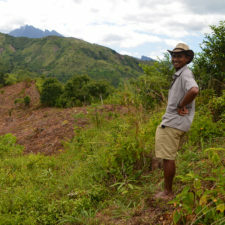 Welcome to the Lemur Conservation Network!